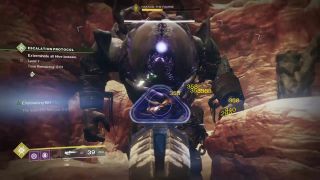 Naksud, the Famine is a unique Hive Ogre that may be summoned during the final wave of Escalation Protocol. It is similar to Golgoroth from King's Fall in appearance, but has different mechanics. Whenever a Thrall touches it or a Cursed Thrall detonates near it, Naksud's health regenerates.